One catch — it's half the size of the original. 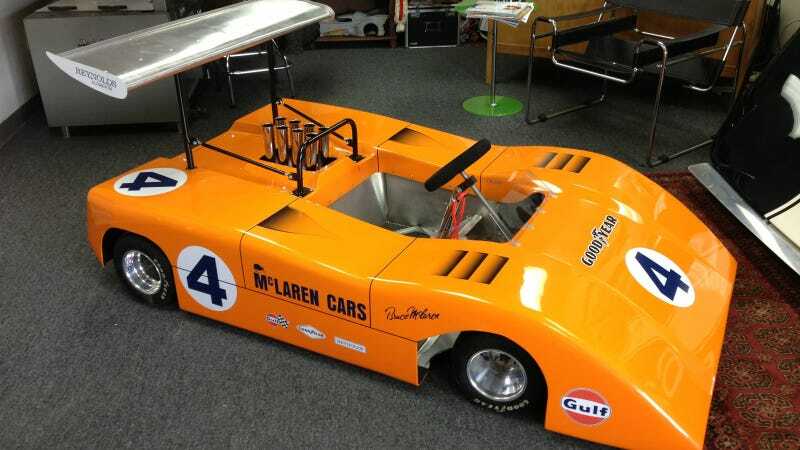 This custom-made fiberglass-body'ed racing kart on eBay appears to be an adorably well executed replica of a 1969 McLaren M8, complete with high wing and pipes protruding behind the pilot's head. According to the listing, this little gem was put together by vintage race prep shop called Putsch Racing, and is powered by a four-stroke overhead valve engine. Other performance features include a cro-moly tubular frame, hydraulic discs, slick tires, and a suede steering wheel. The seller claims the cockpit will accept someone up to 6'1", so this mini McLaren could be your ticket to living out your vintage motorsport fantasies. Or, the best Christmas present ever for a lucky little racer. Hat tip to Nicholas Prangnell via FortyOneSix!